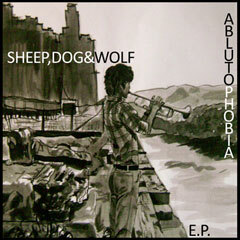 ‘Sheep, Dog & Wolf’ released their bedroom recorded debut EP Ablutophobia a few weeks ago. Download it from Bandcamp for free, or return the favour with a Koha (a boy’s gotta eat). Sheep, Dog &Wolf is one person, 17 year old Aucklander, Daniel McBride. He has played all instruments, drums, woodwind, brass, strings, guitars and vocals to boot. Over the last year he has cobbled together a bedroom studio and taught himself the nuances of recording to an exciting degree. Far from being a closeted homage to teen-self however, McBride has created a homogeneous set of songs, and while complex in their devoted arrangements, they have a comfy folk art appeal that remain fun to listen to as you admire his abilities. Clever. Despite his age, this isn’t Daniel’s first musical venture, he was drummer in the now defunct Bandicoot, an energetic post-punk three-piece with great noise-pop sensibilities. This entry was posted in Music and tagged Bandicoot, Daniel McBride, DIY recordings, Home recording, Multi instrumentalist, Muzai Records, New Zealand indie bands, SheepDog&Wolf. Bookmark the permalink.